If your significant other is expecting a baby, you can help take the stress off of going to the hospital and the impending labor by packing the hospital bag for the baby. This might seem like a challenge, especially if it’s the first baby. However, with a few tips, you can make sure the new baby has everything it needs while in the hospital and for the trip home. 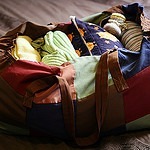 There are also things that you can pack in the bag for the mother so that she will be as comfortable as possible. Try to pack the bag when the mother is about six months through the pregnancy. These are items that might make you feel a little odd when packing them, but they will come in handy for the mother while she is in the hospital. If the mother is nursing, then she will need a nursing bra, nursing pillow and nursing pads. The hospital can provide a binder if the mother does not plan on nursing. Make sure you have a camera and plenty of batteries to take snapshots of the mom while she is willing to let you take her picture and of the baby. You also want to pack the baby book so that the footprints can be added as well as the information about the birth. Keep a contact list in the bag so that you don’t forget who to call when you get to the hospital. Socks with a non-slip sole are good for the mom to wear so that she can walk during labor or to keep the feet warm during delivery. Don’t forget toiletries for yourself and the mother. These include shampoo, conditioner, deodorant, glasses or contacts and toothpaste. Most hospitals have small samples of lotion and soap, but you can take your own items to feel more like you are at home. You also need to pack clothes to go home in for the mom and the baby. Whether the mother plans on a natural delivery or one with an epidural, pack a few snacks and drinks so that neither of you get hungry. Labor could take a few hours, and it is important for the mom to sustain her energy. Pack a few books or magazines for the downtime. A spray bottle can be used to cool off the mother during the delivery. Lotion and oils can be used after delivery, and you can also pack a cosmetic bag so that the mom do her makeup and feel a little more like herself after she has had time to rest. Some of the items that won’t fit in a bag that need to be taken to the hospital include the car seat and video camera. You can also pack scratch mittens so the baby doesn’t scratch its face. An outfit to go home can be placed in the bag, and you should also have a few blankets, especially if the weather is cold.